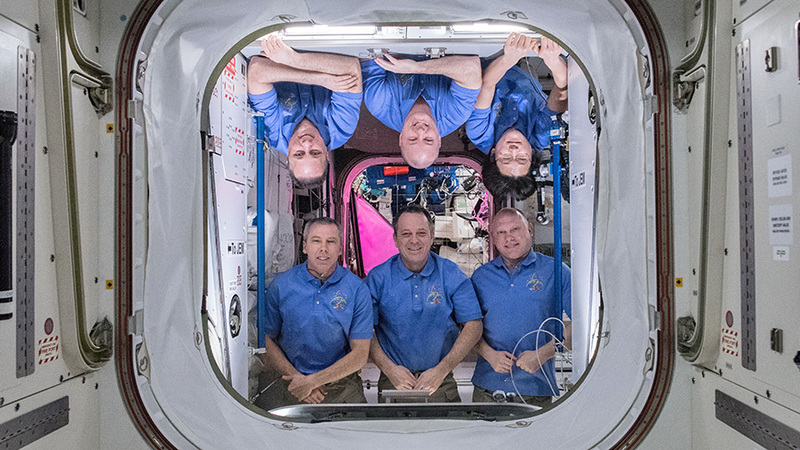 The six-member Expedition 55 crew poses inside the Harmony module which links both the Japanese Kibo and the European Columbus laboratory modules. In the bottom row from left, are Soyuz MS-08 crew members Drew Feustel, Ricky Arnold and Oleg Artemyev. In the top row from left, are Soyuz MS-07 crew members Anton Shkaplerov, Scott Tingle and Norishige Kanai. The International Space Station will be orbiting a little higher this weekend to prepare for the departure of three Expedition 55 crew members and the arrival of a new Russian cargo craft. The docked Russian Progress 69 resupply ship will fire its engines Saturday at 6:07 p.m. EDT for two minutes and 52 seconds slightly boosting the orbital lab’s altitude. This orbital reboost sets up the proper phasing trajectory for the Soyuz MS-07 spacecraft when it undocks June 3. The Soyuz will carry Commander Anton Shkaplerov and Flight Engineers Scott Tingle and Norishige Kanai back to Earth after six-and-a-half month mission in space. The reboost will also enable a two-orbit launch to docking opportunity for Russia’s next resupply ship the Progress 70 in July. Overnight and early Friday morning robotics controllers from the Japan Aerospace Exploration Agency supported the deployment of small satellites from outside the Kibo laboratory module. The Japanese robotic arm attached to Kibo ejected several small satellites to support a series of technology demonstrations. Two spacewalkers and a pair of Flight Engineers continued more computer training and procedure reviews today ahead of next week’s spacewalk. NASA astronauts Ricky Arnold and Drew Feustel will go outside in their U.S. spacesuits Wednesday for about 6.5 hours to swap out thermal control gear that cools external station systems. Tingle and Kanai will assist the duo in and out of the Quest airlock and help choreograph the spacewalk tasks.